Take a look at the photos below. We picked up a nice model of the Gemini with the Rogallo wing that was the early recovery proposal. This is looks to be a built up from a kit (it was fully built when we bought it). 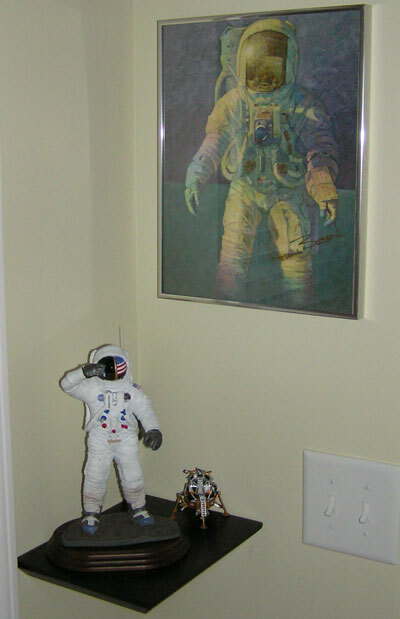 We have it displayed with an old Gemini book with the landing on the cover. Here is a link to some data on the wing. This is looks to be a built up from a kit (it was fully built when we bought it). 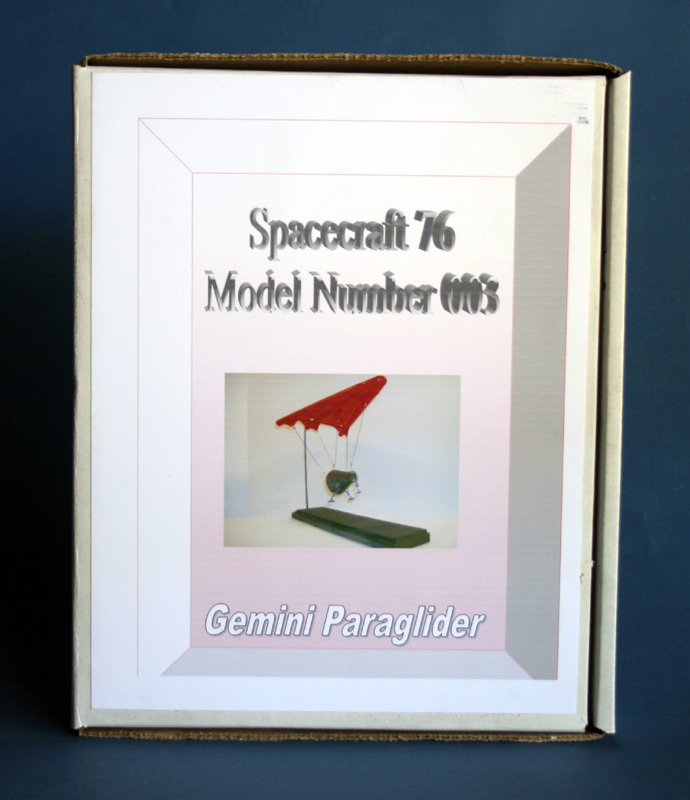 This appears to be the Revell 1/48th scale Gemini model. That kit has the Rogallo type landing gear as an option, though it lacks the wing hardware. A very nice find. There was a kit type. That looks like the kit Pascal, thanks. Well, I just learned something new - didn't know about this kit. I'm looking forward to seeing that model in February. The early concepts are what really get my blood flowing. I still think not flying the MOL and Dyna-Soar was a mistake. Beautiful and unique find Fred. May I ask where you found this? Are the lines from the canopy solid, or have you suspended the canopy from something higher to achieve your display? This was one of those eBay finds and yes the lines are solid. 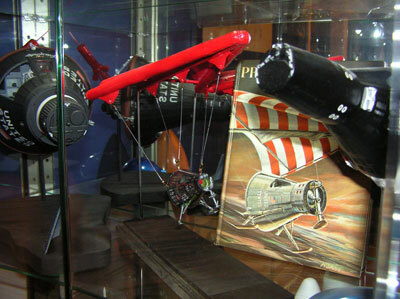 We have it displayed with an old Gemini book with the landing on the cover. Fred, you cost me $10.98 by posting the photo with the old Gemini book in the background. I had to find a copy and buy it just for the cover art. Yes, I will take a check. Come to our space gathering Feb. 11 and I will pay you cash. I think I've seen builtups of that kit before. It is a resin kit that was done at a time when the Revell 1/48 Gemini wasn't as readily available. 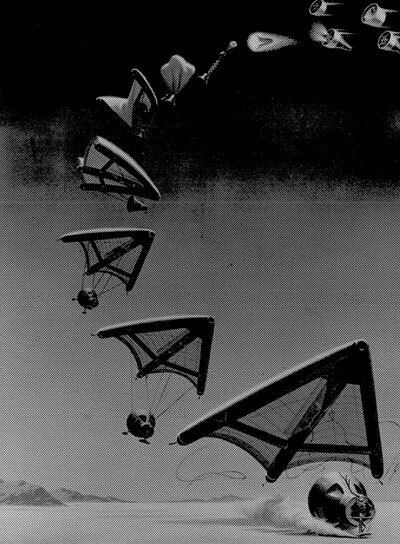 But of course while the Revell kit had the gear in a few of its versions, one needed to scratch the interior of the chute compartment and do the glider of course. I believe the glider itself was vacuuform, but if the size were kept low enough to keep the music wire shroud lines from collapsing, resin elements could probably be used as well. Here is another one of Steve Nichols' creations in our house. It is a fantastic figure. I wish you could see the detail on the visor from the reflection of Buzz in this visor to that of his gloved hand. 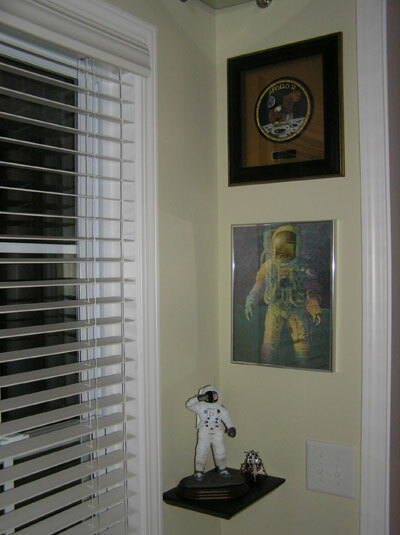 We added it to our Apollo corner. Now that we are in our new house (well two years, but after 20 years in the last one this is still new) we have started getting some displays going in the bonus room. 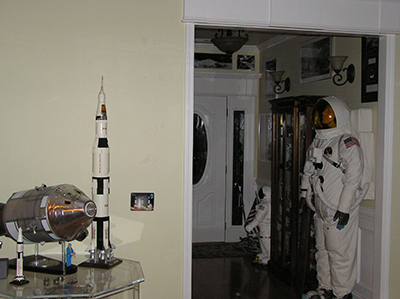 Since we have our full size astronaut display in the foyer to welcome visitors, our lunar leg we built for the Apollo 11 40th anniversary had sat in the corner of the bonus room but itself, kind of out of the way. 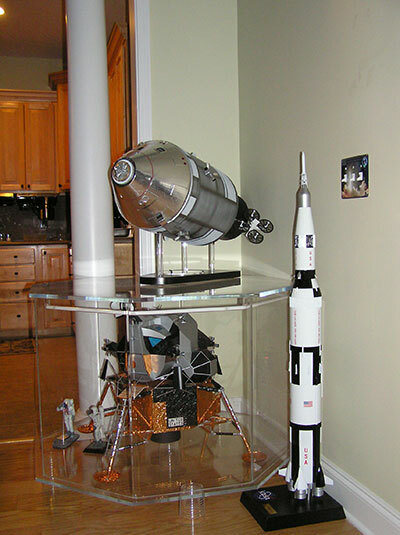 With the Dragon Apollo 11 1/72 scale models coming on board we decided to make a display of them all for Apollo 11 (pardon the Apollo 10 model, we plan on buying the kit version and make it an Apollo 11 specific version). In addition the FatHead Buzz Aldrin was placed on the wall. 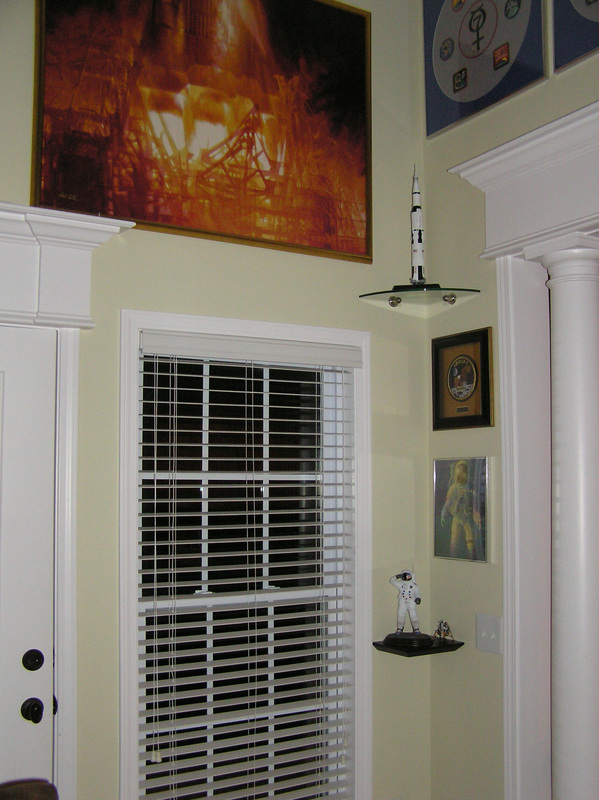 To top it, an original oil painting of the Apollo 11 moon landing painting is set above the leg. It has on the back of it a stamp that states "Donald Douglas Art Museum Sana Monica, CA" as well as a number 29-17 which I assume is an inventory number. Also a signature on the back that is Agnes M. Racke 1970 (if anyone has info on this painting let me know). 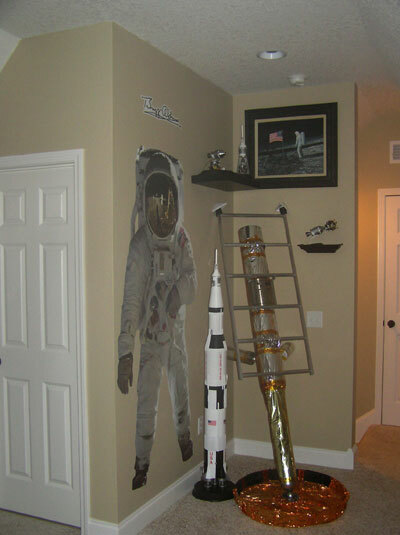 Mmmm, there are SOOOO many possible meanings to the term "Fathead Buzz Aldrin". And yes, I know what a Fathead is. The LM leg is nice. How did you build that piece? The details on the LM leg was posted on another thread and can be seen here. 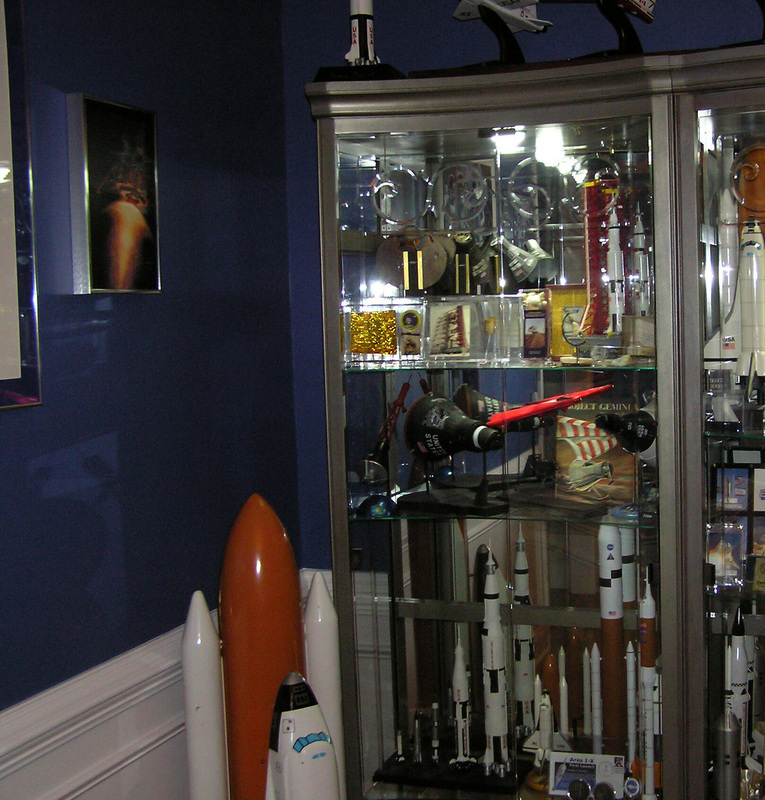 Geesh - my wife would leave me high and dry if I had that much space stuff on display at home! That's why I keep a lot of it on display in my office at work! Having recently visited (and contributed to!) the Karst Kollection, I can tell you that it is truly magnificent to behold. ("Drool-worthy" is the phrase that best comes to mind.) The Karsts have countless beautiful models, artifacts, photos, and artwork, all very tastefully displayed. Any museum would be proud to house even part of their collection, which continues to grow and evolve. Adding to the experience is the fact that they're such wonderfully nice folks who are deeply passionate about space exploration, from both a people and technology viewpoint. You owe yourself the chance to meet the Karsts and see their collection if you're ever near Savannah, GA or passing down I-95. Thanks for the kind words Johnathan, it is always good to have someone view the collection who knows what it is they are looking at. 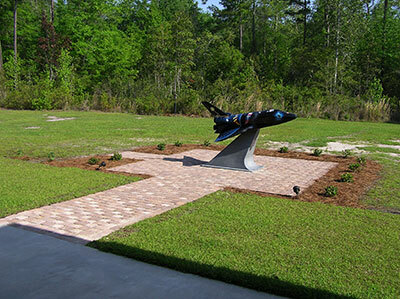 We did complete the new outdoor display of the ASF shuttle that Tim Gagnon completed. Attached is the final product the new area in our backyard off of our existing patio. We are looking to possibly and a sun sail over this area to keep some of that southern sun off of this creation. For all cSers out there, tours are always welcome, drop on by. That looks great Fred!! Do you have something new in mind for outside your house? 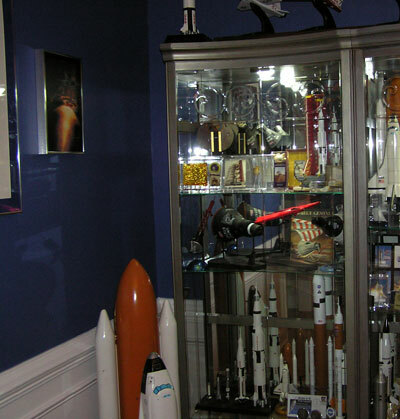 Your collection of space related artifacts and art is simply stunning. We have had a couple of additions to our collection here lately. 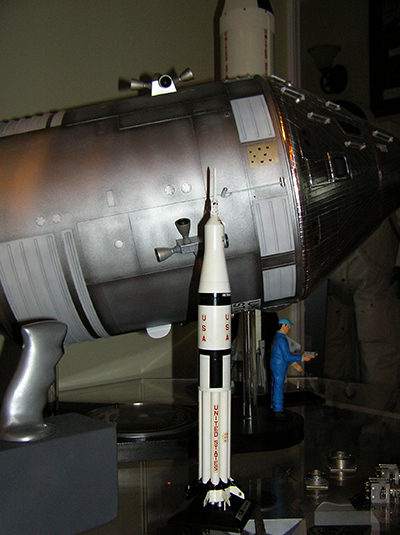 The first is a 1/12 scale CSM to partner with the LM shown in this thread. The CSM is a creation by Carlos Santos (Santos Design Solutions). He is Scorpius on this forum. Carlos has built for us the Accurate F-1 engine, Custom GI Joe Mercury with LES and a scratch built 1/48 Skylab, all of which have been posted on cS. It is an amazing build and we picked it up from him a couple of weekends ago as part of 2300 mile 3 day trip that took us to see Discovery in Dulles, the USAF Museum as well as the bullet holes in the Davison Center in Huntsville. It was a great trip and the transportation fixture Carlos made for the return trip was perfect. The second picture is that of the 1/72 Saturn V converted to a Skylab model by Pascal. Another wonderful build by him and a wonderful final display. Beautiful models Fred. Is a 1:1 CM by Luigi next? Well that would be a nice addition! I'm already working. I was called from the bay of New York, Enterprise was destroyed! My friend Freddo is desperate! Fred, they are absolutely beautiful. Steve, I think Fred must make next year more space, building a new house wing. Speechless Fred, I wish my wife was so cooperative I would fill my house to the brim. Fantastic collection keep it up. 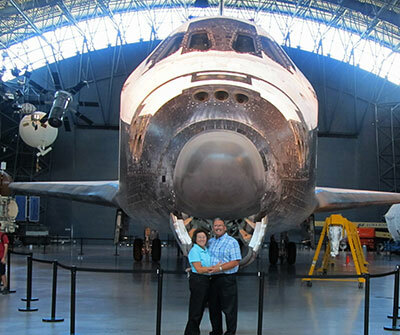 I love the photo of you both in front of Discovery. I wish you many more grand trips sharing this passion together. Jackie and I have picked up a few new items for the collection. 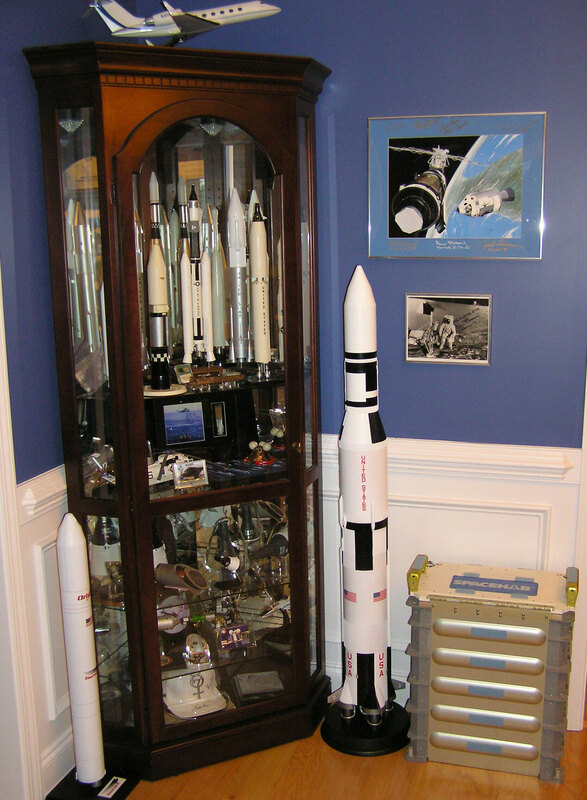 From the last Regency Superior Auction the 1/200 MSFC Saturn 1B and then from a private sale a 1/96 Marshall Space Flight Center (MSFC) Saturn V.
The IB is in great shape except that the LES is missing. I have a 1/200 AMT CSM/LM model I won on eBay that I will take the LES from and use it as the LES for the MSFC model (unless anyone has an original they would like to donate to a good home). As far as the Saturn V goes the SM has some minor damage that can be hidden just by they why we display it. The original LM is missing but in a couple of days, with Jackie's help, I have built the 1/96 scale Revell kit we had as a replacement (again, if anyone would like to donate an original that would be great). The biggest issue is the SLA. The SLA, it turns out, has been glued into the S-IVB stage such that I can not install LM I built. 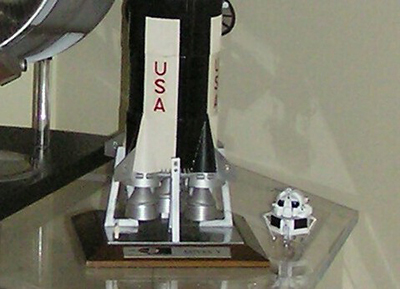 I have looked at it and have thought of ways to try and get the LM into the SLA (most of which involves using some form of cutting) and as Jackie reminded me, I always say "better is good's worst enemy" so for now I have elected to display the LM along side the Saturn V in the Landing Legs in the stowed position. It is a great model and very clean. 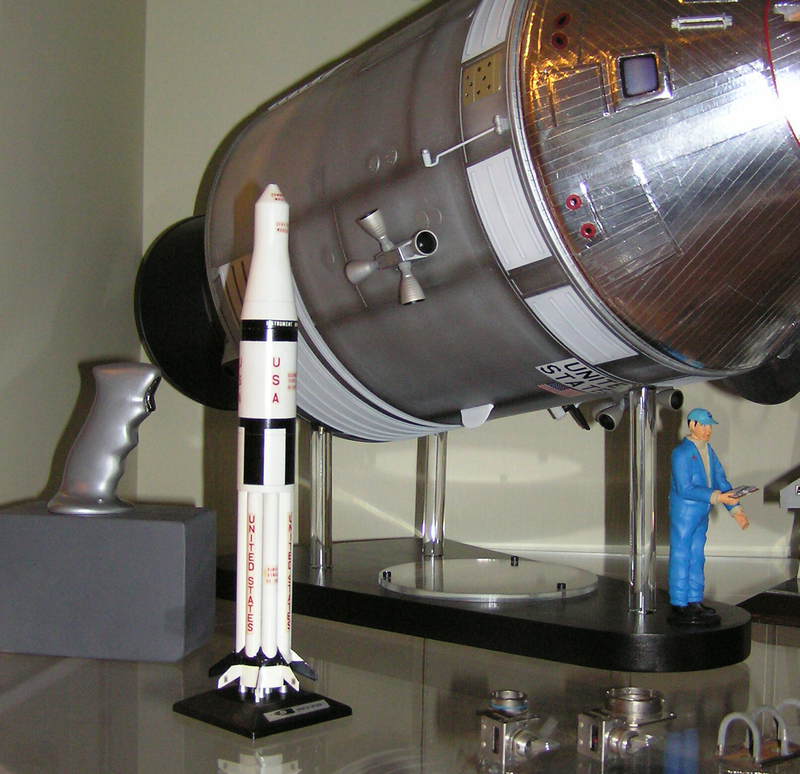 It has a history that this Saturn V model was displayed at NASA Kennedy Space Center in the office of Director of Launch Vehicle Operations, Dr. Hans Gruene. This comes from the owner who was a NASA engineer as well. Really nice Fred, but how do you manage to keep all those models dust free? If I had to do that in Malta with all the house dust within a month you wouldn't recognize them. In this house we do have a special filter in the A/C system. Dusting is about a yearly event but with some careful attention it is not bad. 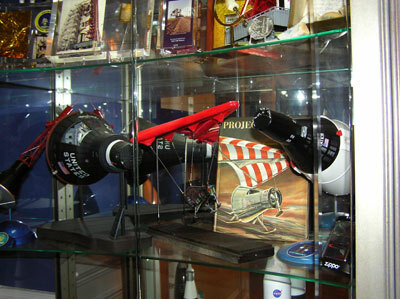 It is a great way to see and remember all of the items in the collection and recall when we acquired them. They all have a story attached. In this house we do have a special filter in the A/C system. Congrats Fred, especially on snagging that MSFC 1/96 Saturn which for many of us collectors represents a holy grail. The filter for the house is a Aprilaire filter. 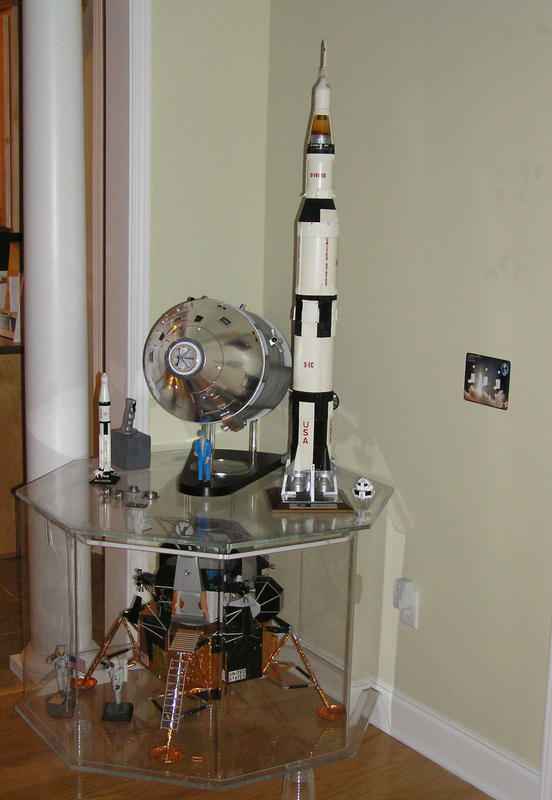 Fred, the Saturn V looks great! You've got a better collection than any museum I can think of. Also, a BIG thanks to Jonathan, as he was instrumental in this latest acquisition. Gee I really wish you were into large highly detailed X-15's! This is a great community here on cS. 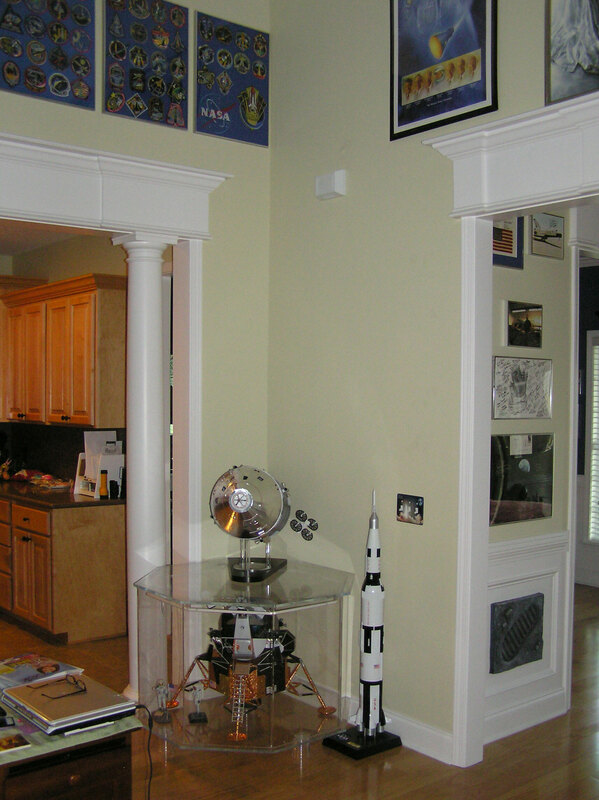 I made mention of needing a LES for the Saturn IB as posted above and one of our own come through. A big thanks to Dave (dtemple) for getting me a 1/200 scale kit of the CSM/LM from AMT that included a LES. We put it together and the Saturn IB is now complete and looks great! Thanks again Dave.